Unlike the other E28 5 Series models, M5s were assembled by a small group of BMW Motorsport technicians who mated the drivetrain and interior trim with pre-painted bodies transported from the Dingolfing factory. This hand-assembly took place in one of two facilities, depending on the production date. E28 M5s produced before September of 1986 were assembled at BMW Motorsport's original Preussenstrasse location near the BMW AG headquarters in Munich, while E28 M5s built beginning in 9/86 were assembled at the newly-opened BMW Motorsport headquarters in Garching, roughly 16 kms (10 miles) north-east of central Munich. The only exceptions were M5s produced for the South African market, all of which were assembled at BMW's Rosslyn, South Africa factory from German-supplied Complete Knock Down (CKD) kits. When BMW of North America first anounced the E28 M5 in late 1986, production was said to be limited to 500 cars. This same production limit was also specifically mentioned in the original U.S.-market sales brochure. By the time production of the E28 M5 ended in November of 1987, however, over 1,200 examples had been produced for the U.S. market. Thus, a class action lawsuit was filed against BMW of North America in 1991 by E28 M5 owners who claimed that the collector's value of their cars was diminished by the greater volume. The company settled the case by giving E28 M5 owners a $4,000 certificate (transferable to anyone) that could be applied towards the purchase or lease of a new BMW. Because the E28 M5 was hand-assembled, yet needed to be manufactured for the North American market in relatively large numbers within a relatively short amount of time, BMW of North America was forced to limit the model's specification to just two color schemes: Black (086) with a Natur (tan) leather interior and (officially for Canada only) Black (086) with a black leather interior. 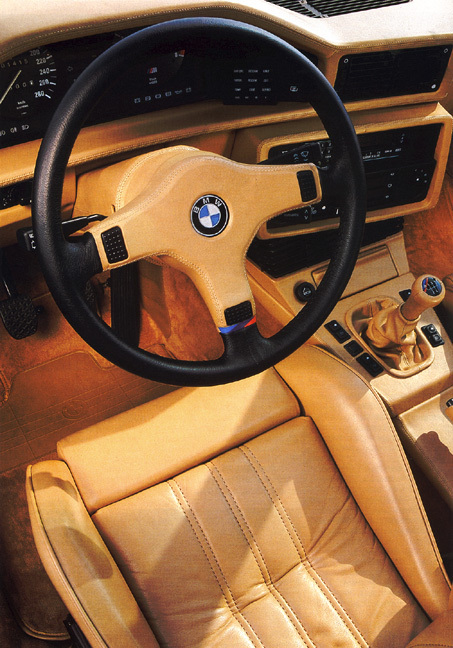 Though a Natur (tan) extended leather interior was the only official interior color choice for the U.S. market, Canada insisited on giving E28 M5 buyers the second option of a black extended leather interior. 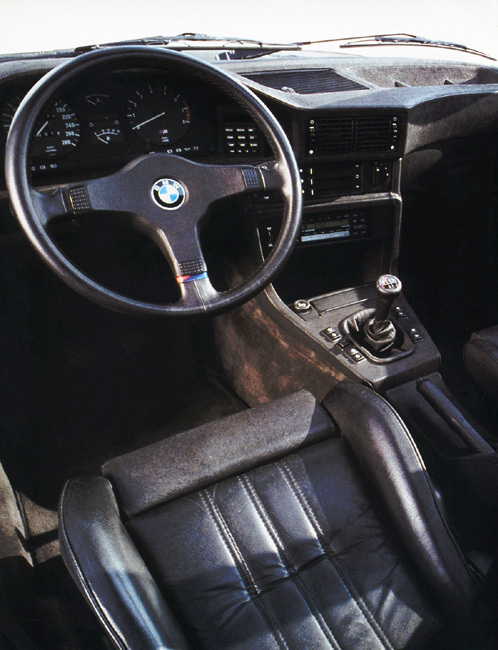 The black interior option was later expanded to the U.S. market at the very end of E28 M5 production. In total, 101 E28 M5s with a black interior were produced for North America, of which 71 were built to Canadian specification and the rest to U.S. specification. BMW Motorsport built five different versions of the E28 M5. European-spec models were offered in both left-hand drive (DC91) and right-hand drive (DC92) configurations, all equipped with the non-catalyst M88 powerplant. In addition, E28 M5s powered by the catalyst-equipped S38 motor were offered in both North America and Japan, exclusively in left-hand drive form, and these all carried the DC93 model designation. Finally, a small batch of right-hand drive E28 M5s with the non-catalyst M88 engine were assembled in South Africa from Complete Knock Down (CKD) kits and sold locally under the DC98 model code. Does every example of the E28 M5 utilize a "WBS" VIN prefix? Starting with the E28 M5, all products from BMW Motorsport GmbH were assigned a "WBS" VIN prefix to distinguish them from the non-M BMW AG vehicles, which retained a "WBA" prefix. However, the first 26 left-hand drive ECE examples of the E28 M5 were produced with the regular WBA prefix. Though it is true that BMW Motorsport produced 1,370 examples of the DC93 version of the E28 M5, this figure is rather misleading because it actually encompasses all E28 M5s produced for the USA, Canadian and Japanese markets. If you subtract the 30 examples produced for Japan (which differ rather extensively from those produced for the USA and Canada, despite sharing the same VIN sequence), then the total for North America is actually 1,340 units. 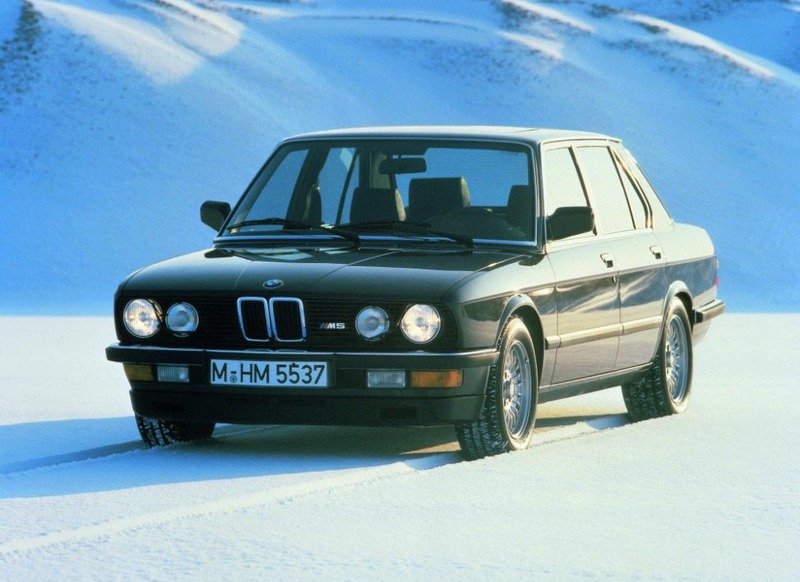 A total of 101 E28 M5s were built to Canadian specification, while the remaining 1,239 were built to U.S. specs. Aside from minor differences in instrumentation (imperial versus metric), U.S. and Canadian E28 M5s are identical. The M88 is the non-catalyst version of the S38 engine. With a 10.5:1 compression ratio, 264-degree camshafts, equal-length exhaust headers and a single-row timing chain, it is identical to the one found in the non-catalyst versions of the E24 M635CSi coupe. Power is rated at 286 hp (DIN) at 6,500 rpm with 251 lb/ft of torque at 4,500 rpm. 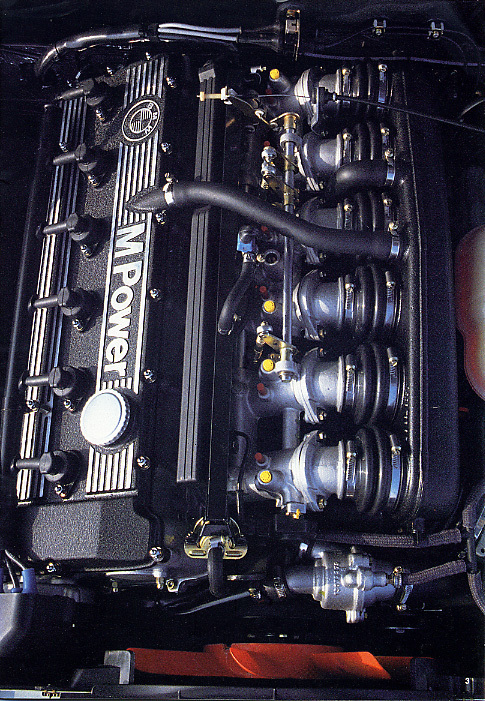 The M88 can be identified by the BMW Roundel and only the words “M Power" on its valve cover. The S38 s the “clean” version of the M88 motor, introduced to allow E28 M5s sold in the United States, Canada and Japan to comply with stricter emissions regulations mandated by those governments. It utilizes a duplex (double-row) timing chain, 248-degree camshafts, a simplified exhaust manifold and features a lower 9.8:1 compression designed to work with catalytic converters. This reduced the horsepower to 256 hp (SAE) or 260 hp (DIN) at 6,500 rpm and torque to 243 lb/ft at 4,500 rpm. 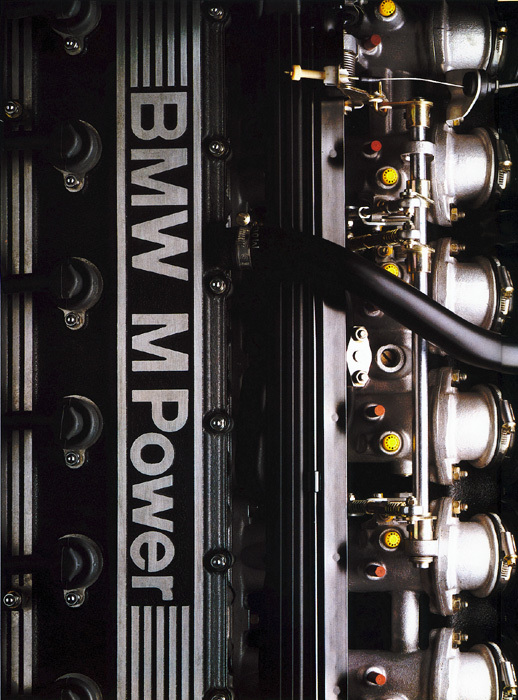 The S38 can be identified by the words "BMW M Power" on its valve cover. All E28 M5s have the Getrag 280/5 five-speed manual gearbox. Gear ratios are as follows: 3.51 (1), 2.08 (2), 1.35 (3), 1.00 (4), .81 (5). A 3.73:1 final drive is fitted to the non-catalyst (M88) versions, while a shorter 3.91:1 rear end is used on those with the S38 powerplant. All have limited slip differentials with a maximum locking of 25 percent. Up front, European-spec models produced before approximately late September/early October of 1986 feature unique Bilstein shock inserts (shared only with the European-spec M635CSi) mounted to standard E28 struts, plus a 21mm anti-roll bar. However, beginning in late September/early October of 1986, the front shocks were updated to a different iteration from Boge (also specific to the M5) and the anti-roll bar was enlarged to 25mm. In the rear, European-spec M5 built before April of 1986 retained standard E28 components, including the springs, shocks (Bilstein) and a 14mm anti-roll bar. However, the M5 received unique rear springs beginning with April 1986 production, followed roughly six months later by a switch to Boge rear shocks and a larger 18mm rear anti-roll bar. Two different factory alloy wheels were available for the E28 M5. 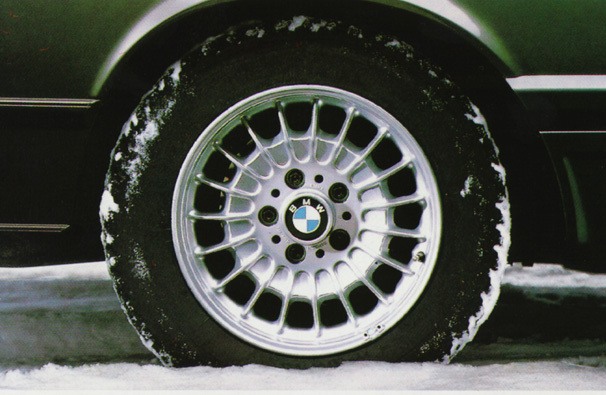 The majority of DC91 examples were equipped with metric-sized forged alloy wheels shared with the M635CSi and also used on some other 6 Series and 7 Series models. These measure 195mm x 390mm and are shod with 220/55VR390 tires. Later in production, the E28 M5 was also offered with 7.5x16-inch cross-spoke alloy wheels carrying 225/50VR16 tires, usually Pirelli P700s. These wheels were standard on right-hand drive E28 M5s from the start of production in early 1986, then added to the option list of left-hand drive models starting in September of 1986 (i.e the start of the 1987 model year). In addition, all North American-spec E28 M5s, as well as those produced for Japan and South Africa, received these same 16-inch alloy wheels as standard equipment. Because the intention of BMW Motorsport was to hide the performance capabilities of the M5 within a standard-looking 5 Series body, there are few external items that differentiate the European-spec E28 M5 from any other E28 sedan. The only body panel that is unique is the black plastic front airdam, included to reduce front end lift at high speeds. There is also an M5-specific aerodynamic engine compartment undertray, body-color rear-view mirror housings and a pair of "M5" badges, one on the grille and another on the trunk-lid, though these could be omitted upon request (which was common). In some European markets, the M-Technic aerodynamic package (as fitted as standard to the E28 M535i) was offered beginning with the 1986 model year (9/85 production). This consisted of body-color extensions with ribbed trim (front bumper and lower airdam, side valance panels, rear bumper and lower diffuser), the M-Technic rear spoiler and dechromed side moldings. This option could be ordered with or without Shadowline trim and with or without the optional 16-inch cross-spoke alloy wheels and body-color fender lip extensions. In the UK, cars without the optional M-Technic aero package still received the M-Technic rear spoiler as standard equipment. Though identical in basic design and layout to that of any E28 5 Series, the interior of the E28 M5 is fitted with a few special items. All examples have a three-spoke M-Technic steering wheel also used in other BMW models. Most are also equipped with sport front seats, though a few were fitted with the standard "comfort" versions by request and some even had genuine Recaro front seats in place of the BMW items. In some markets (including North America, the UK, Spain, France and Japan), both the front and rear seats include an M tri-color stripe attached to a metal tag. 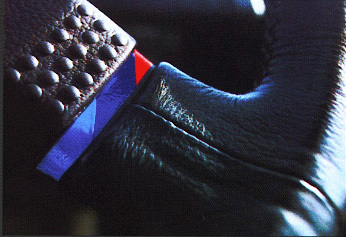 On the earliest cars, the leather shift knob is topped with only an "M" logo and the shift pattern appears as a sticker attached to the ashtray lid. This was changed in early 1986 to a version with both the shift pattern and a tri-color M stripe. 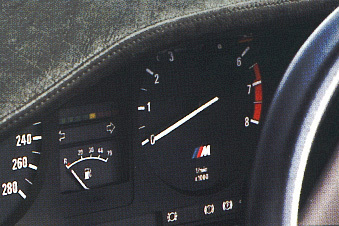 The instrument cluster contains a unique 280 kph/170 mph speedometer and a special tachometer with the M logo instead of an economy meter. 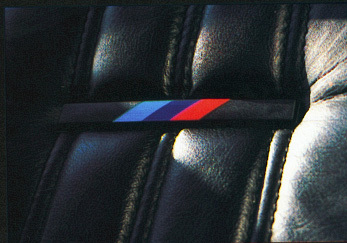 Later examples (likely from 10/86 production) also have special door sill plates with the "M5" logo, map lights in the rearview mirror and, on cars with Anthracite or Black upholstery, an M5-specific black headliner. Finally, the trunk of the E28 M5 is unique for four reasons. First, it contains the battery in a special right-side compartment, secured by one of two different covers, depending on the production date. Second, it is lined with a plush carpet. Third, with the exception of the earliest examples, the lining on the inside of the trunk lid is black instead of the usual light grey. Finally, there is a special cargo net to secure loose objectrs, though this also does not appear to have been fitted to the earliest cars. Because the E28 M5 was assembled largely by hand at the BMW Motorsport facility, European customers could not only choose from the entire range of normal E28 options but also request more specialized features like hand-stitched complete leather interiors and/or integrated electronics such as phones, faxes, and minibars. Thus, depending on the market and production date, the E28 M5 could be very sparsely equipped or extremely luxurious. However, every E28 M5 features power mirrors, central locking, and the Check Control vehicle function monitoring system. Options varied from market to market but generally included metallic paint, Shadowline (dechromed) exterior trim, headlight washer/wipers, interior headlight am adjustment, leather upholstery (in various grades), air conditioning, the second-generation on-board computer, power front seats, heated front seats, power windows, power sunroof or power moonroof, rear-window sunshade, rear headrests and various audio systems. The North American-spec E28 M5 uses the same government-mandated sealed-beam headlights (all four of the same diameter) and 5-mph bumpers with integrated side marker lights as all U.S. and Canadian versions of the E28 5 Series. However, the M5 adds a special front airdam designed specifically for the North American front bumper, as well as the M-Technic rear spoiler fitted as an option to some European-spec examples. Though these items are not specific to this model (both are also found on the E28 535is), the M5 can further be identified by its Shadowline trim, "M5" grille and trunk-lid badges plus the unique 16-inch cross-spoke alloy wheels. Unlike the wide variation of color, trim and equipment found in European-spec E28 M5s, all North Americans-spec interiors have Black or Natur leather sport seats, with additonal hide on the seats, center console, glovebox door and door pulls. In addition, all have the M tri-color seat stripes (front and rear), black headliner and "M5" door sill plates, while the carpeted trunk always features the black lid lining, cargo net, later-style battery box enclosure and left-side storage compartment. Standard equipment included air conditioning, power seats, power sunroof, cruise control and an AM/FM radio/cassette with BMW Sound System. Heated front seats were technically the only factory option in the US (standard in Canada), though nearly every car was equipped with them. What distinguishes the Japanese-market E28 M5 from those sold in other markets? BMW Motorsport produced 30 identical E28 M5s for the Japanese market during January, February and March of 1987. Though they share the same mechanical configuration as the catalyst-equipped E28 M5s sold in the USA and Canada, and are therefore included as part of the same DC93 VIN series, their appearance is far more similar to that of European-spec E28 M5s. In fact, the only notable visual difference is that the Japanese-market M5s were equipped with four identically-sized headlights instead of the smaller inboard high beams. Each of the 30 Japanese-market E28 M5 were Diamond Black metallic (181) with Anthracite Highland cloth upholstery (0186) that featured the tri-color M stripes on the upper backrests. Standard equipment included the M-Technic aero package, Shadowline (dechromed) exterior trim, power glass moonroof, 16-inch cross-spoke alloy wheels, air conditioning, power front seats, cruise control, rear-window sunshade and velour floor mats. NO OFFICIAL SPECIAL VERSIONS OF THE E28 M5 WERE PRODUCED. The following chart lists all regularly available paint colors for the E28 M5. The following chart lists all regularly available upholsteries for the E28 M5. NOTE: For DC93 models, Natur extended leather (0237) was offered in both the U.S. and Canada, while Black extended leather (0232) was officially offered only in Canada. However, 30 U.S.-spec E28 M5s with Black extended leather were produced in 11/87. 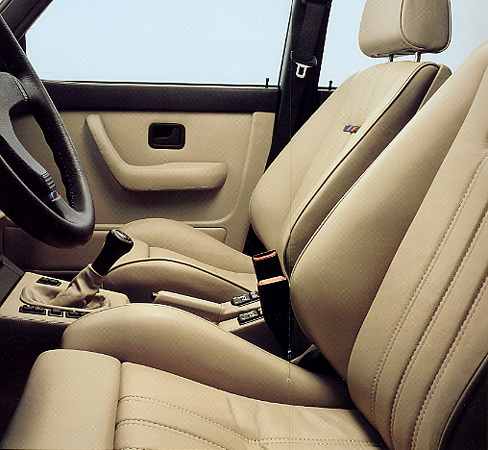 For DC91 and DC92 models, both the 0232 and 0237 interiors included complete leather coverage.